The Filianic Scriptures are written in beautiful language that contains many interesting surprises. One is that, while being laid out as prose, many of the Filianic Scriptures use a complex and musical verse-form known as Ithelic meter. It is said that in the Golden Age, all maids spoke in verse or in song. Their language was closer to the angelic language. 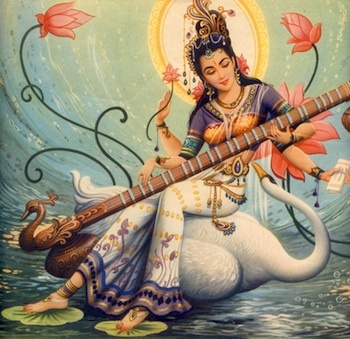 The Primordial Word (from which all language derives) and the Primordial Note (from which all music derives) are ultimately one and the same, and it is from them that all manifestation derives—for the True Names of things are not other than the things themselves, and the relations between things are not other than the Celestial Music. For this reason, the use of poetic meter in the Filianic Scriptures is considered not just beautiful but truthful. The meter we are discussing today—Ithelic meter—is a five-beat structure that alternates melinic with chelanic line-endings. A melinic ending is on a stressed syllable, while a chelanic ending has one unstressed syllable after the last stressed one. A line may begin with one, two, or no unstressed syllables, since the rhythmic pattern begins with the first stressed syllable. While Ithelic meter has five beats, like iambic pentameter (the meter Shakespeare uses for the blank verse in the plays), it is unlike iambic pentameter in that there are two unstressed syllables between each stress, rather than one, making the lines quite a bit longer, and more appropriate for their marriage with the wave-like prose of the Filianic Scriptures. Everyone who has attended Service will be aware that many passages of the Scriptures have a very definite rhythm. They are not written in verse, but there are certain occasions where the prose-rhythm is actually so strong that it may be broken into scanning lines, and many of these are strictly Ithelic. 32. Like to a mist is this world that surroundeth the pillar; to a mist that is swiftly dispelled by the cold wind of death. 33. Hold you fast to the Truth, for the Truth is thy shelter; sure refuge ’gainst which neither death nor the storm shall prevail. 34. This world shall be scattered like straw, and an hundred shall follow; and each in its turn shall be scattered like chaff on the wind. 35. The empires are born and decay, the stars live and perish, but the pillar of Truth moveth not by the breadth of an hair. Now Filianic Scripture is not verse per se. It is not expected to work to a strict meter. It deploys a range of quasi-musical rhythms to express what is humanly beyond expression. It is flexible and moves between verse, rhythmic prose, and arrhythmic prose with angelic lightness. We will now analyze the verses as they scan to Ithelic meter. We use / to represent a stressed syllable and . to represent an unstressed syllable. To those unused to prosodic analysis, this may at first seem abstract, but it is actually deeply intuitive and an important part of the way language works in our souls. We strongly recommend that the reader read them aloud so that she can hear and feel the rhythm. To a mist that is swiftly dispelled by the cold wind of death. As you see, it follows Ithelic meter exactly and is a melinic/chelanic couplet. Also note that while the first line has no syllables before the first beat and the second has two unstressed syllables before the first beat, the rhythmic pattern is the same, as it "counts" from the first (stressed) beat. So we have a truncated Ithelic line with a chelanic ending (as the first line of a couplet always is). Sure refuge ’gainst which neither death nor the storm shall prevail. And each in its turn shall be scattered like chaff on the wind. But the pillar of Truth moveth not by the breadth of an hair. However, others attribute this to legitimate rhythmic variation, bearing in mind that this is rhetorical prose rather than verse. Note here that there is an extra unstressed syllable at the end of the line. This cannot of course be done in strict line-scanned verse, but you will also see that it does not break the rhythm in “Ithelic prose” because the second unstressed syllable simply works rhythmically as if it were a pre-beat syllable of the next “line” (of which we are allowed up to two). The rhythmic effect of this may be compared to tempo rubato in music. Where shall they be in an hundred score years from this day? in the measureless life of thy soul. In true verse-form Ithelic, this, of course, would be impossible, but we must view this passage as something more like a musical composition with an Ithelic base. Now just out of interest, let us take a “modernized” version of this Scripture published in Telluria. Its aim is to make the Filianic Scriptures “easier” and more readable. The changes are not huge, but see if you can scan this rhythm! 36. Like a play is your life, and the acting of an actor; like a painted scene is all the things of the world. 37. The things of your life, its acts and its purposes; where shall they be in two thousand years from this day? This is an interesting reflection on the depth of Filianic Scripture. It contains so many things that we may not be aware of, and if we try to make "our own version" we will inevitably leave out things we have not seen or do not understand, and change important things of whose importance we are unaware. The Filianic Scriptures are not simply factual statements—indeed, they are not factual statements at all (which would imply that they were bound to the material world of flux and change, incidents and facts). They are a reflection of Truth, and Truth is something that cannot be expressed in words but only reflected in them. "The Tao that can be spoken is not the true Tao". The music of the Filianic Scriptures is as much a part of their Essence as the paraphrasable meaning. This does not mean that we each have a "private truth" in the sense that the modern mind would interpret that: a paraphrasable quasi-factual statement that differs from other people's. It means that truth is not directly conveyable by words and that words are only hints and guideposts to the Truth. This is why the ancient Greeks called the speculations that could be written and spoken "philosophy" (philo-sophia = love of wisdom). Even the best of them—such as Plato's—are not Wisdom Herself, but only the love of wisdom that can lead to inner realization. It is the heart-Spirit within each of us that can receive Truth, not the rational-verbal mind. The words of Filianic Scripture are guideposts to Truth that in many cases manifest sacred rhythm as well as purely verbal formulae. They work on many levels, some of which we can analyze (as we have analyzed the rhythm of one passage here), some of which defies all verbal analysis. The Filianic Scriptures talk a lot about music. Filianism is a religion of harmony. They also contain music, which is a vital and inseparable part of their Essence.